I am working on my MFA creative nonfiction thesis about food foraging. I asked my father to talk about my first experiences with wild food. One of my pleasures was taking Lauren out in the backpack, walking quite long distances, and she loved to ride in the backpack. I learned to stop and grab berries where I found them and I’d feed some to her. She’d showed great delight in it. She couldn’t talk but she made lots of noises that indicated she was enthusiastic about it. The thing that I learned, it was kind of amazing, was that she remembered ever berry patch we passed. If I made the mistake of walking past the berry patch without giving her something, she would make loud noises until I turned around and started grabbing berries for her again. She even ate the wood strawberries, which most people find barely palatable and probably only eat in desperation. Whenever Lauren saw the wood strawberries would lean down start making sounds of want and desire, so I would have to stop and give her some of the wood strawberries. Even on the bicycle when she was riding in the back seat, when she saw the wood strawberries, I’d see her leaning, way, way down looking hard at them and making sounds indicating she wanted the wood strawberries. Another thing she enjoyed were persimmons. At first I made sure I gave her the persimmons that were sweet, but she would keep demanding. Finally I decided maybe I would give her one that wasn’t quite so sweet. She still seemed to make great sounds of pleasure. Finally I gave her one that I was pretty sure was going to be pretty unpleasant, but she loved it anyway. Somehow she wasn’t sensitive to the bitterness in the persimmons. The amazing thing about it was her incredible memory for where every berry bush was and how she would always signal when we were near a berry bush that she expected me to stop and pick berries for her. As she got older and she could walk she also would stop for the berry bushes. It was humorous to look around and see her face all covered with juice and stains running down her chin. The look of delight on her face was just irresistible. There were mulberries, blackberries, wine berries, a few blueberries, not many. Wine berries were pretty close to the top of the list for her. There were some real wild strawberries. Dewberries, she would eat. It’s very much like a blackberry. It grows on a very low vine. 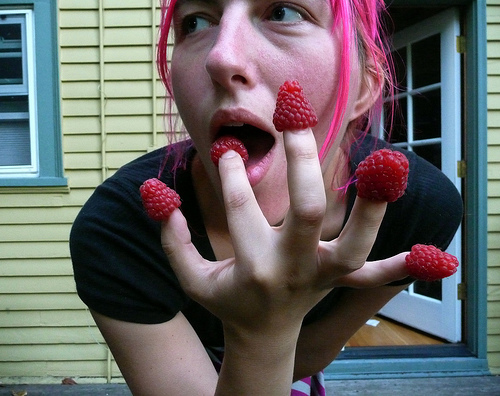 And then we had some raspberries, black, and red, too. I was able to find them under the pressure of having to find them. When we indicated that the berries were gone, they were gone. She recognized that and we moved on to whatever might still be in season. Of course, persimmons were late in the season. And the wood strawberries were there for quite a while. She was just happy and would wait until next season. Meanwhile, ice cream would do in a pinch.